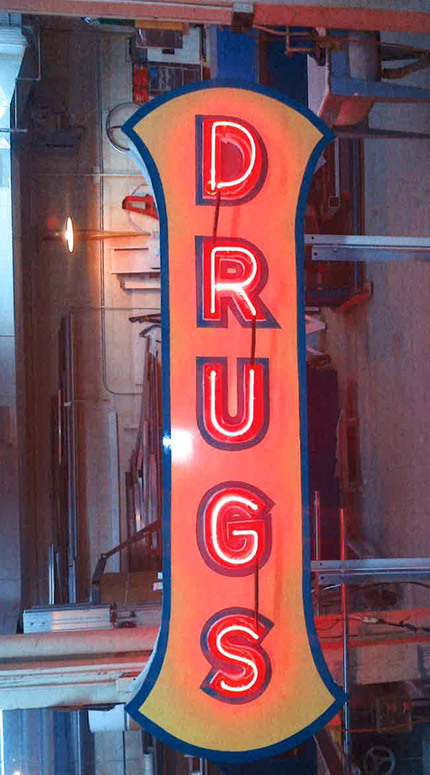 The first neon sign in Edmonton was put up on Darling's Drug Store in 1928. Such businesses have been among the most common sites for neon signs over the years. This sign appears to have been discovered in the basement of the Stovel Block, constructed on Namayo Avenue (97 Street) in 1910. There is a story that the sign appeared originally on the Armstrong Drug Store, although this remains unconfirmed. Armstrong Drug Store first opened on Namayo Avenue near Boyle Street (103 Avenue) in 1907. Armstrong Drugs offered its services to the public at this location for the next nine decades. George S. Armstrong, the owner, served as mayor of Edmonton and City Commissioner during 1912-1913. Between 1920 and 1950, M.J. Warner was the proprietor of Armstrong Drugs and Stationery. In 1950 George J. Andrews took over.